My name is Daniela Rubio and I work with children who are blind. I am always interested in resources that aim to improve children’s knowledge and understanding of reading and writing in both braille and ink as well as helping to improve their mobility. This is a really important part of their early development so finding the right resource is very important to me. During my time in Special Education I have discovered a wealth of different digital educational games and resources. Yet, it wasn’t until I discovered Skoog that I was blown away. When I first discovered the iPad I started incorporating it into my daily learning activities. I was able to access a range of sound resources that blind children were very receptive to. There are some great Apps available, however I always felt there was something missing. There was nothing available that would allow children to interact with a physical object whilst using an iPad. Whilst they could hear the sounds and enjoy the reward when giving a correct answer, they could not enjoy the colourful pictures that sighted children love so much, or indeed relate a shape with a sound. In games related to music, the problem was the same. The interfaces were totally “untouchable”, and if we connected a keyboard, we realised that some of the fun was taken away for beginners. That wasn’t until I came across Skoog. I immediately could see the amazing potential that it could bring for blind children who use iPads. I was impressed by the fun shape and texture. When I started testing Skoog to see how accessible it was for blind users, I showed it to some middle school children who quickly understood how it worked and enjoyed playing with it. I was immediately excited and couldn’t wait to test it out. After I had explained what colour was each face, she started building “coloured” songs to combine colours and notes. We started to play Twinkle Twinkle Twinkle Little Star, and straight away she knew which colour corresponded to each note, even when I changed the scale. For the first time, she was able to create her own music! After a while, she was immersed into an amazing colour and sound world, and she even began to change the Skoog sound using the iPad. She even made up a story in which there were little beans living in each face of the cube. The creativity and imagination that the Skoog brought about was incredible! I thought that for a child who had never been able to see, this was a great shift in her perception pathway. Now, she could use her iPad with something that could actually play music, could combine with colours, and of course share this experience with sighted children. My experience with Skoog and Selena was absolutely wonderful. 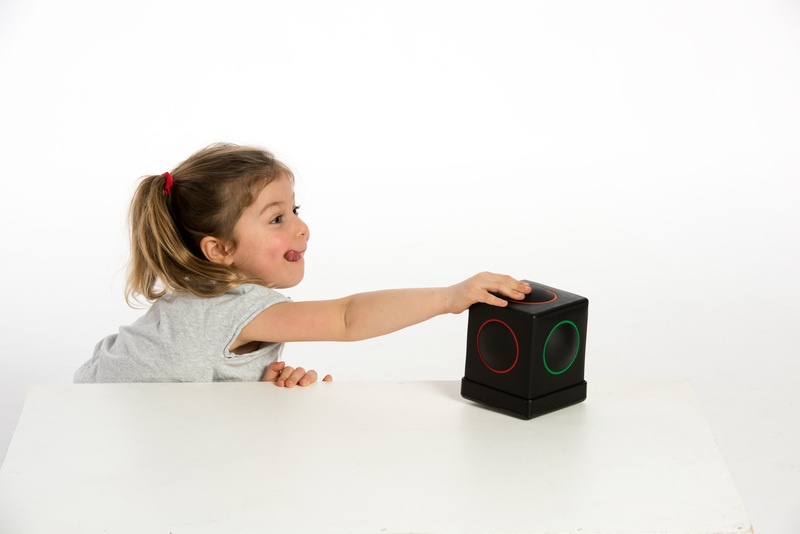 It was even greater to hear that her teacher at school was thinking in getting a Skoog for all children to play with which will allow Selina’s to integrate and collaborate with her sighted peers in the classroom. There are so many possibilities that an iPad can give us, and the flexibility of apps together with the developer’s imagination, I believe that there is a lot more to dream about and a huge potential for using Skoog to aid learning for both sighted and blind children. Just think about what can it do for other children if it was capable of changing Selina’s perspective of sound and colour!